Be the first to share your favorite memory, photo or story of Barbara. This memorial page is dedicated for family, friends and future generations to celebrate the life of their loved one. 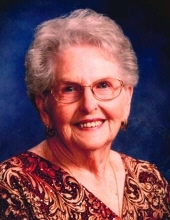 Barbara Ellen Van Hooser, age 86, of Princeton, passed away Friday, February 8, 2019 at Princeton Health and Rehab. Barbara was a member of First Baptist Church in Princeton and a charter member of the Caldwell County Historical Society. She was a 1949 graduate of Fredonia High School. She retired after 16 years as the Caldwell County Clerk. She is survived by one daughter, Ellen Dunning and husband, Sam of Caldwell Co.; three sons, Phillip Van Hooser and wife, Susan of Caldwell Co., Mark Van Hooser and wife, Mona of Princeton, John Daniel Van Hooser of Puryear, TN; one step-son, Jeff Schiltz of Mt. Vernon, WA; eight grandchildren; ten great-grandchildren; three step-grandchildren; three step-great-grandchildren; several nieces and nephews. She was preceded in death by first husband, Joseph Phillip Van Hooser; second husband, Robert Joseph Schiltz; parents, Hobert Henry and Thelma Lucille Duvall Traylor; two step-sons; three sisters, Margaret Wiggington, Pansy Paris and Joyce Vinson; two brothers, LeRoy Traylor and Billy Joe Traylor. Funeral services will be held at 11:00 AM Tuesday, February 12, 2019 at Morgan's Funeral Home with Rev. Jim McDaniel and Rev. Russ Davidson officiating. Shawn and Laura Fagin will be providing music. Burial will follow at Morse Cemetery. Visitation will be held from 3:00 PM until 8:00 PM Monday, February 11, 2019 at Morgan's Funeral Home. Expressions of sympathy may be made to Morse Cemetery, C/O Mike Franklin, 206 Cumberland Drive, Princeton, KY 42445 or Fredonia Cemetery, Fredonia City Clerk, PO Box 152, Fredonia, KY 42411 or Caldwell Co. Genealogy Society, C/O Linda Ward, 401 E. Market Street, Princeton, KY 42445 or any charity of your choice. You may light a candle or leave a message with the family at www.morgansfuneralhome.com. To send flowers or a remembrance gift to the family of Barbara Ellen Van Hooser, please visit our Tribute Store. "Email Address" would like to share the life celebration of Barbara Ellen Van Hooser. Click on the "link" to go to share a favorite memory or leave a condolence message for the family.